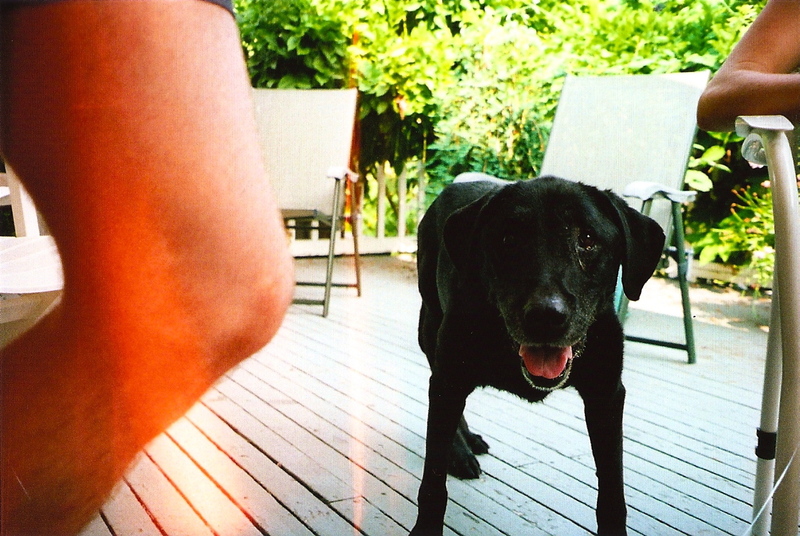 i moved to British Columbia to start university in the fall of 1995. a week hadn’t passed before I decided to get a dog to help ordain my final departure from adolescence into the first type of adult independence one experiences when leaving home. i had just turned 19 and this beautiful 8 week old labrador was to become my right hand girl for almost the next 17 years of my life. her name was Zooey and i just wanted to write a few things in her memory. to say i had the best dog in the world would seem cliche and it actually wasn’t the case at all in the beginning of our relationship. the truth is, i never should have been getting a dog in my freshman year in the first place, as i did not have the adequate time or space to give to her. needless to say, she was a real undisciplined menace at first and i had a very hard time trying to train her. labs are very independent, super hyper as puppies and ridiculously food obsessed. the combination did not make for a dog who listened . i remember buying a loaf of bread each day and it taking a few weeks to realize that i hadn’t been eating this bread at all. Zooey had been jumping up on the counter and was just eating the whole thing, plastic bag and all, so as there would be no evidence to bust her with. this type of behavior was commonplace and the battle between who was boss would continue like this for years. it was war during the day, but each night she gave up temporarily to crawl into bed with me and give me glimpses of the peace to come. now i don’t know if it was some sort of cosmic fate to have such similar personalities, but me and Zo’s complete and utter recklessness seemed to bound us together, and much like me, Zooey seemed to just get away with almost anything. there was a near drowning while trying to follow me out to surf not realizing how dangerous the water was. multiple misses of screeching cars while running away from me, god knows how many more i didn’t actually see. she was the most captured dog in victoria’s SPCA history one year with 14 impounds. i remember realizing one way to find her when she’d bolt off was to drive up and down the streets looking at all the tipped over garbage cans that she had pillaged, and when i would see a street that was untouched, i would wait till she popped out to tip them over and tackle her. she was dropped off a two story roof deck during the famous snowstorm of 96 and shook off the jump like it was just another day. she was even kidnapped and left tied to a tree for the police to find her 30 plus hours later. she really could just take a beating. and so on went the years and she continued to be there for me. through heartbreaks and comedowns, tremendous success to complete failure multiple times. my sisters death. having to quit school. losing my mind many times. lost friends. more deaths to more heartache and set backs. but this grounding, regal, majestic, lovely animal was my constant throughout all of it. it didn’t matter what i did, where i went to, when i would be back, or how low i had fallen, i always knew she would be there for me.